Articles that don’t quite fit into other categories. Thunderbird Atlatl will be at the SVE Sportsman’s Show in Spencer, NY Saturday, Feb. 2 & Sunday, Feb. 3. The show runs from 10 a.m. to 5 p.m. Sunday and 9 a.m. until 3 p.m. on Sunday at the Spencer- Van Etten High School, Darts Crossroads, Spencer NY Admission is free! We will be at our booth through 1 pm on Saturday and from noon to 3 on Sunday. There is a variety of exhibitors from hunting with dogs to hunting with guides. artists, taxidermists, wood carvers, archery shops, fishing experts and guides. Archery range petting zoo and fly casting area for kids. Falcon and hawk seminars, dog training and game calling seminars too. Youth 3D archery tournament, (bring your own gear). Seminars, DEC officers, hunter safety instructors. Bring your trophy mounts to hang in our “Hall of Horns”. The Lucky Buck will be back! Sunday is “The Dog Days of Winter” At 10:00 is the “open” to all breeds match sponsored by the school’s FFA. Food and drinks available for sale by high school clubs. Breakfast and dinner served in the cafeteria. The Thunderbird Atlatl staff is planning events for 2019. We plan to be at events in Florida in February. We will be posting the information for the shows. They will be at Silver Rivers State Park in Silver Springs, Florida and Ochlockonee River State Park in Sopchoppy, Florida. Looking forward, we plan to be at the Pennsic War again in August; the Stonetool Show at Letchworth State Park in August and the Flint Ridge Knapin in Ohio over Labor Day. We will also be in Vermont in September at the Chimney Point State Historic Site annual event in Vergennes, Vt. There will be International Standard Accuracy Contests at these events. Our staff is busy working at getting atlatl orders out. Give us a call if you have any questions or need anything special. As always, our loyal canine helper, Tina, travels daily to our local post office. 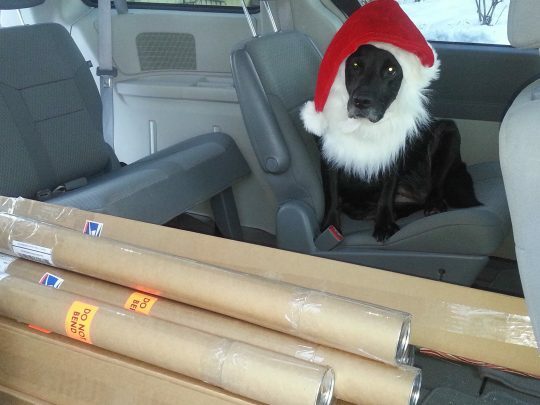 She makes sure the packages leave our shop and are safely delivered for the start of their journey. Tina is one of our most loyal workers. She makes sure she helps with deliveries to the post office every day. During the Christmas season, she gets to dress up! A couple of other helpers-Fletcher & Molly. This was from a couple of years ago when Fletcher was visiting. 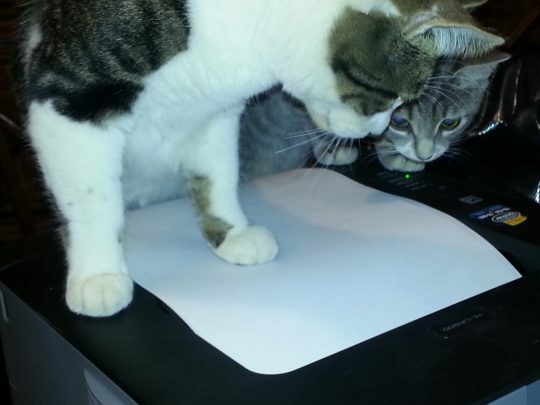 However Molly and her pal, Opal, continue the work. Try to get your orders in before December 18, the post office and other carriers are guaranteeing delivery by Christmas as of December 20th.